Made fresh in the kitchens of Ferguson Lodge and delivered hot, everyday, to your door. We all know that eating regular, nutritionally balanced meals is important to our continued well-being. We offer older people a high quality and reliable Meals at Home service. There’s a varied menu full of classic dishes. Choose from roast dinners, nutritious fish and healthy salads as well as delicious puddings, fresh fruit and homemade soup and sandwiches. Lunch and tea are available 7 days a week made fresh by our chef at Ferguson Lodge and delivered by our dedicated chefs. Our menus are offered in a four week rotation and changed seasonally, so there is lots of choice and variety. 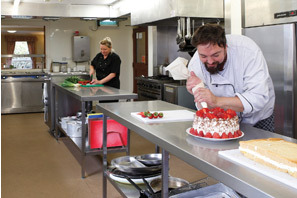 We cater for those with special dietary requirements, allergies and intolerances. Whether you just want lunch twice a week or need daily deliveries of lunch and tea, arranging and ordering is easy and fast to arrange. Speak to our Meals Co-ordinator, we will arrange a free assessment visit to make sure we know all your likes, dislikes and requirements. Ordering can be done over the phone or online and don’t worry if you change your mind, just give us a few days notice and we can make changes to your order in minutes. Contact us now to discuss your needs or to receive an information pack with menus, costs and information on funding.